Posted under Catering News ME, Events, News. Opening the day we have an exclusive presentation from the Emirates Authority for Standardization & Metrology (ESMA) on the hugely important issue of Halal. This is followed up with a panel discussion on the issue of Eating Locally, with panellists including RIPE, the Organic Café, Slow Foods, and Baker & Spice. Marriott International follows with a detailed breakdown of its Project Canvas, which is rewriting the rulebook in F&B financing. Dr. Graham Simpson then leads a panel discussion on the role of F&B in tackling the obesity crisis. He is joined by Beatobesity UAE, Be Super Natural and Kcal. We then turn to the design experts for a discussion on Creating Authentic Design Concepts, with contributions from BeSpoke, Tricon and Gates Hospitality. Around midday we have a workshop on Secure Supply Chains hosted by 4Corners, which is followed by a lively panel on the issue of The Untold Employment Crisis, with ICCA, Tonique Consultancy and Liwa Minor. Dubai Municipality will close the discussions with an analysis of the lessons learnt from the recent Milan Expo ahead of Dubai 2020. 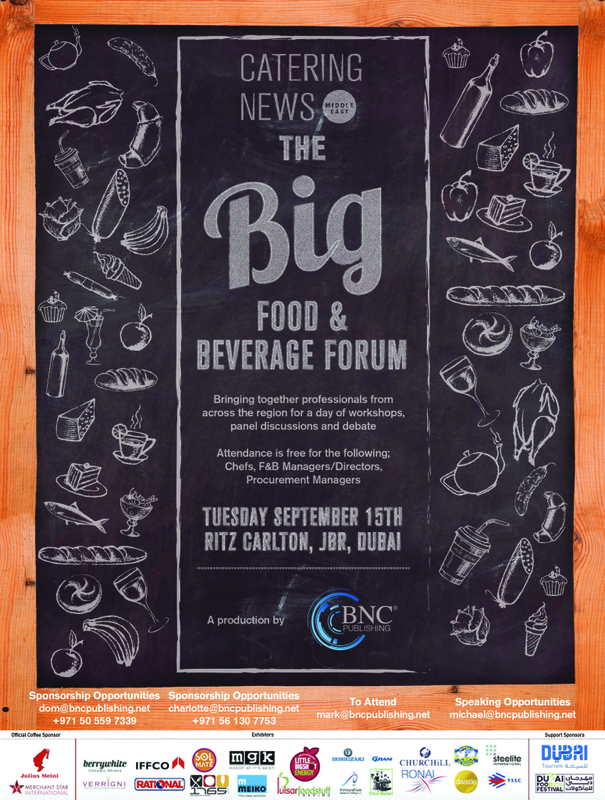 Bringing together professionals from across the region for a day of workshops, panel discussions and debate, the Forum is free to enter for Chefs, F&B Managers/Directors and Procurement Managers. But you must reserve your attendance soon, at Mark@bncpublishing.net, to avoid disappointment.